Welcome to Racerhead, where the off-season grinds on. 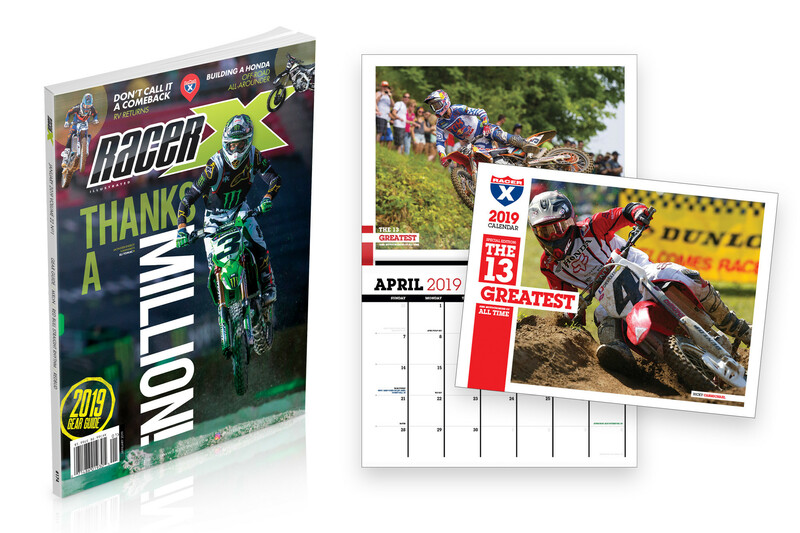 It’s another weekend of mostly non-racing for the pros and amateurs alike: the Mini Os are finished at Gatorback Cycle Park in Florida, and the only big off-season race happening is the Geneva Supercross in Switzerland. Steve Matthes is on site and will have more on that later. The GNCC banquets are happening here in Morgantown, West Virginia, with ATVs tonight and the motorcycles tomorrow. I will apparently be on Camera 2 for RacerTV.com, which will be live streaming both nights. There’s also the big FIM Awards gala going on over in Andorra, a small sovereign microstate in the Pyrenees Mountains between France and Spain, kind of like Monaco without a coast. I believe 2018 Monster Energy AMA Supercross Champion Jason Anderson is there, as it’s mandatory for all FIM World Champions to be there. Other than that, the off-season grinds on. Race teams and privateers alike are training, testing, and doing all of the things to get ready for Anaheim 1. Photo shoots are happening for autograph stock, and gear companies are trying to work out logo placement on jerseys and helmets and fenders and team rigs, and I’m running out of things to write…. So let’s give out some awards! Starting tomorrow, December 1—and with a nod to our comrades at both PulpMX and Vital MX, who already do similar year-end awards—we’re going to give out the 1st Annual Racer X Awards, presented by Maxxis. We’ll be naming our best of the year in everything from race teams to races, best minicyclist to best vet rider, best new rule to best comeback, best broadcast to best photo—you get the idea. And in honor of The Man, we’re calling each Racer X Award a “Roger” based on the iconic 1974 Cycle World cover of Roger DeCoster at the ’74 Carlsbad 500cc U.S. Grand Prix of Motocross, shot by Fernando Belair. 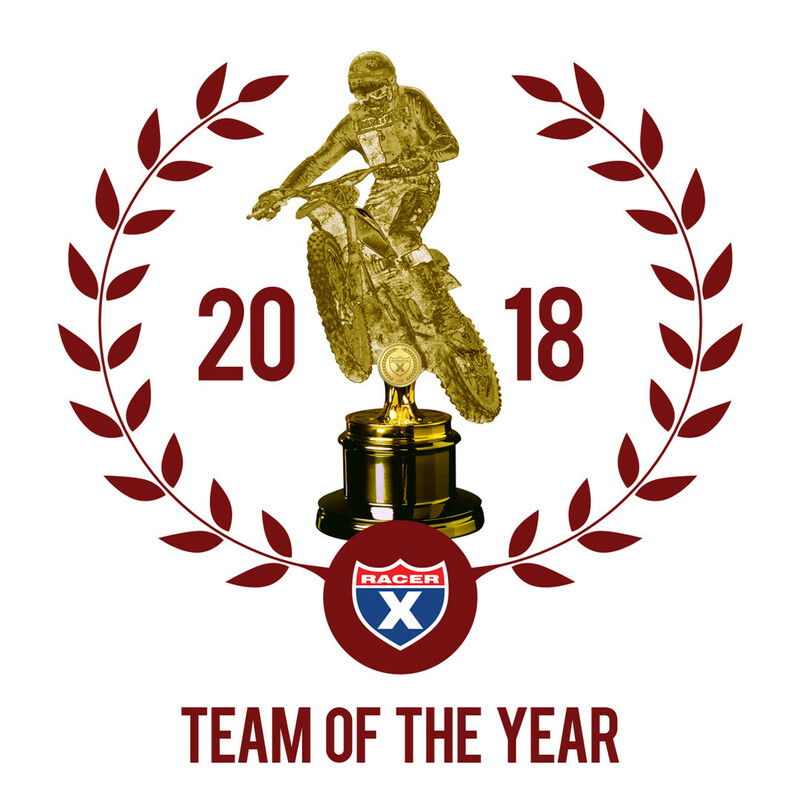 We will be giving out a Roger every day in December, starting tomorrow with the 2018 Racer X Team of the Year, presented by Maxxis. Check it out tomorrow right here at Racer X Online. Practice is over in Geneva, and before I head back to the hotel to eat club sandwiches with all the riders, I thought I'd recap the day that was. It started off horribly for the Honda guys, as Christian Craig, Cole Seely, and Malcolm Stewart all had lost bags. Stewart's suspension didn't show up until late in the day, and that caused him to miss practice (outside of three laps). Eventually the stuff showed up, though, and everyone could race, but it was a bit sketchy for the guys at first. Zach Osborne topped both practices and has the fastest time going into the night show, but there's just a second between Osborne and Craig in eighth, so it's not like there's a big gap there. But still, the #16 450SX rookie showed the veterans like Justin Barcia and Justin Brayton what was up. The track's pretty basic, but there is a quad onto the top of a tabletop that not everyone was doing. Sneaky good in practice today was Cedric Soubeyras. Soubs was feeling it, getting flat over the finish too. The big joke (that Justin Brayton dropped at the press conference) is that Justin Barcia got LASIK surgery, so all the other riders are hoping that he can now see them and won't be hitting them. Stay tuned for that. We're doing an hour-long pre- and post-race show over here on Pulpmxshow.com, and here’s the pre-race. Post-race should be around 5:30 Eastern, we're thinking, but stay tuned to PulpMX and Racer X Twitter for the official drop. You can watch the race live here. We'll also do a little post-race write up for the site tonight, so stay tuned for that as we try to recap everything that went down. And here’s a quick get-well-soon to Deven Raper after he got banged up pretty good last week while testing for supercross. Friends have set up a GoFundMe page for the privateer who went down hard on November 21. Oh yeah, we’re back! Next week the band is back together, as Jason Weigandt, Steve Matthes, Jason Thomas, and David Pingree will be headed to a top-secret location to film our annual Racer X Supercross Preview Shows. For the past five or so years, we’ve filmed them right here in Morgantown, West Virginia, at the Racer X HQ. This year, thanks to the constant, borderline-annoying nudges by Matthes, we’ve decided to take the show on the road to California. That's the heart of supercross bench racing at this time of year, so we'll be right in the mix to get all the scoops from the shops and test tracks. Per usual, we’ll divide the shows into five parts, which will be released on Racer X Online throughout December. We’ll cover all the hot topics, share some laughs, let Steve rant about nets or whatever else is on his mind, and, well, you should know the drill by now. Special thanks to our sponsors for making this all possible: Monster Energy, Pro Taper, 100%, LS2 Helmets, and New Ray Toys. Earlier this week, we released our latest Longform, “Urban Rumble.” It’s the untold story of the 2017 East Rutherford Supercross—and it’s not even about Marvin Musquin pulling over for Ryan Dungey. That’s how crazy that night was! Racer X editor-at-large Aaron Hansel did a great job covering one of the wildest nights of racing, which took place in the semis and LCQ. He talked with privateers Deven Raper, Dakota Tedder, Tyler Enticknap, Alex Ray, AJ Catanzaro, Ronnie Stewart, and more. Seriously, watch these videos and tell me you don’t want to read this story. If you really want to dive deep into this night, you MUST also listen to the Racer X Podcast done after the race with Steve Matthes, Jason Weigandt, and Jason Thomas. It’s pure gold. You can listen to it here; it starts around the 52:24 mark. There is a big difference between Italian female motocrossers and Italian male motocrossers. Italian WMXers have had some successes both in the FIM World Motocross Championship as well as AMA championships. Stefy Bau was a WMX Champion, while six-time FIM World Champion Kiara Fontanesi was able to win a WMX round as well as an AMA Amateur National Championship at Loretta Lynn's. Italian men, on the other hand, have been successful mainly in the World Championship. Italian riders have collected 17 world titles in all, while in America they could take only very few successes. The best-ever Italians are multi-time FIM World Champions Antonio Cairoli, Alex Puzar, Alession Chiodi, and the first-ever Italian to win a world title, Michele Rinaldi. For the most part, they have not been interested in racing AMA Supercross. In AMA Supercross, there have only been three Italians to ever make it into main events. They are three-time 125cc World Champion Alessio "Chicco" Chiodi, Davide Esposti, and Angelo Pellegrini. Esposti qualified for the 2004 Indianapolis 125cc SX main event and finished 17th. Chiodi was more successful, getting a couple of top-five finishes in 1999 on a Husqvarna. And then there is Pellegrini. Like Esposti and Chiodi, he has made some mains in what is now the 250 class, but unlike them, he also has results in the premier class. Before heading to America, the 31-year-old took part in the FIM Motocross World Championship in MX2, but he is mostly a supercross specialist. He has a European SX title, Italian SX titles, and he is an SX/AX racer in France, Germany, and Great Britain. Pellegrini hails from Brescia, a city in northern Italy that hosted the 2009 FIM Motocross of Nations. He debuted in the U.S. in 2012 racing in the 250 East Region. He returned five years later to race 450s in Salt Lake City and East Rutherford, with a best finish of 19th place. He then scored 450 MX points at Hangtown. Pellegrini’s 2018 season was unsuccessful after he suffered a shoulder injury in the British Arenacross opener. But despite this unlucky break, Pellegrini was given a tryout with the MotoConcepts Honda team for the first part of 2019, providing him technical support, motorcycles, and parts. Pellegrini’s contract goes for the first six rounds. He will be under the same tent as ’18 Daytona winner Justin Brayton, Vince Friese, and former 250SX Champion Malcolm Stewart, although Malcolm’s deal is not official. It's a huge chance for the stadium racing veteran to finally have a breakthrough in America. This one deserves more than just the headline: A 37-year-old man and his wife wanted to announce the gender of their child and started a fire that burned 47,000 acres in Arizona. The man immediately called police and fire department for help, and it took a full week for hundreds to put out what became known as the Sawmill Fire. The man was then given a bill of more than $8 million, with a first payment of $100,000. The last line of the CNN story is a gem: "According to KGUN, the Dickeys haven't said if the child was a boy or a girl. But the blue puffs as the target exploded might be a clue." Looking for a bitchin’ piece of land in SoCal?